we have a Scratch Builder Campaign approved. Of course, count me in. I am enlisted. Hi guys - I just signed up - looking forward to this! I cannot imagine a Scratch Builder Campaign without you,gentlemen! Bace, I'm enlisted. I'm waiting for a campaign start signal. Okay I have signed up - be gentle with me when I start posting my humble offerings... I'm no where near as skilled as some of you guys. At this point I have no idea what I might be building for this campaign but I have enlisted. Most likely I will be finishing my Oshkosh Mk??? 8x8 LHS or my Mk??? 4x4, or both! I would like to start that big WWII Australian flightline crain based on a CCKW but I am very loaded up with projects right now! Just joined up with this very intriguing build, will have lots of questions & hope to learn lots!! A what-if Allied SPG using a M3 Stuart and armed with a 6dr. *the StuG VI is not to be confused with a JagdTiger. Where to sign? Help me with a link, pls. Hello, just a quick question if you don't mind, does the finished scratchbuild need to be painted to be considered 'finished'? Or in other words, what constitutes finished? The build must be painted to be considered finished. Well heck - seeing this pop up...I'm "scratching" to get building! To do my first build, I've got to do some heavy duty cutting on a kit...and the weekend is here...hmmm...and I have a full box of sharp #11's......I might just start! If this disqualifies me, maybe I'll do something else for the campaign...if not, I just took a pic of a pristine, 1/25 scale, Revell Chevy truck body....for proof it's a new build! Happy weekend fellow model builders! Grabing your knife now does not disqualify you. And you're right - now my worlds of work and hobby are colliding - safety...at work, safety is a constant subject of awareness - though I spend much of my time in an office! Home though, on a nice Saturday - a different story! Lol - the sharp #11, saw, pin vise, cutters - as much as I'm begging to make a joke about it all, a slip with the knife can really do some damage to a finger, hand (a compressor hose) etc! It hurts, is messy, and generally should be avoided! Yes - being careful when building a model makes plenty of sense! Does the scratch build have to be armor? I am thinking about scratch building a catapult for my nearly finished Arado 196. (I intend to build-among other things- an ZIF-55 compressor). So- flying, crawling, sailing, roaring by, supporting or just pumping air- all these mechanisms fit in. A door that is wide open! Here is what I definetely will build for this Campaign. 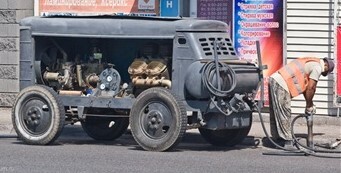 A ZIF-55 Compressor Trailer in 1/35th scale. 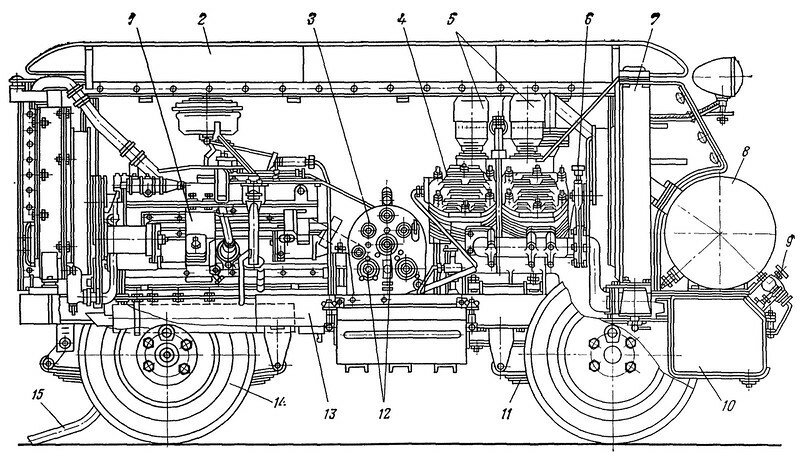 It will be the early version- where a ZIS-120 engine drove a 4 piston V-shaped compressor. Been eyeballing some "donor" kits lately-an ZIS-151 truck by HobbyBoss and MiniArt's ZIS-5 wheels set. I intend to build the Compressor Trailer open- can't stand showing all the beauty inside.